This iZombie bean bag is made for watching Liv Moore on TV. 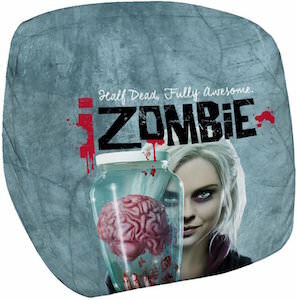 The bean bag has a almost stone kind of look and on top of that a big picture of Liv Moore holding up a car with a brain in it and of course it also has the iZombie logo and the text “Half Dead Fully Awesome” above that. The iZombie chair comes with a styrene filling so that you have a chair that is ready for you to sit comfortable in. Bean bags are fun and comfortable and perfect for watching iZombie on TV.